Three Army soldiers who were gunned down during a three-hour firefight in the Salahuddin province north of Baghdad last week may have died from friendly fire, military officials said Tuesday. The three 101st Airborne Division soldiers were part of an Army company that was attacked by as many as 15 insurgents on Jan. 8 after the soldiers discovered several large caches of explosives. Military officials said the incident is being investigated to determine whether the soldiers were killed by shots from the enemy or by U.S. troops, including members of their unit and aircraft called in for backup later in the battle. A detailed account of the incident was described by several officials to The Associated Press. The officials spoke on condition of anonymity because the investigation is not complete. The three soldiers were part of Alpha Company, 2nd Battalion, 327th Infantry Regiment, 1st Brigade Combat Team. They were searching buildings southwest of Samarra early that Tuesday morning when they found more than 1,000 pounds of homemade explosives, two 55-gallon barrels rigged to blow up, a roadside bomb, and bullets and bomb-making materials. Soon afterward they found that a second building was also filled with explosives, guns, ammunition and a disassembled suicide vest. According to reports, the soldiers continued searching the area, and later discovered four vehicles loaded with explosives. And at that point they determined that there were at least two insurgents hiding nearby. When they moved in on the insurgents, reports said the soldiers discovered an extensive tunnel and trench network that was being defended by 10 to 15 of the enemy, who attacked the company with mortars, grenades and guns. The two sides fought for about three hours, escalating to a massive battle with U.S. aircraft blasting the insurgents with rockets, several 500-pound bombs and .50-caliber guns. At some point during the fight, soldiers discovered that two members of their unit - Pfc. Ivan E. Merlo, 19, of San Marcos, Calif., and Pfc. 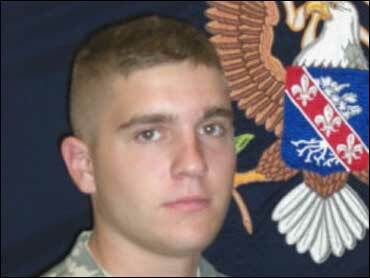 Phillip J. Pannier, 20, of Washburn, Ill., had been killed. Three others were injured, and one of them - Sgt. David J. Hart, 22, of Lake View Terrace, Calif. - died later. The soldiers are based at Fort Campbell, Ky. The names of the injured soldiers have not been - and are not routinely - released. It is not clear how many enemy insurgents were killed. Five school children were killed Tuesday after being struck by a car in the convoy of a top judicial official during a chaotic gunbattle with checkpoint guards, police and hospital officials said. The children, ages 6 to 10, were hit by the car during an exchange of gunfire between the official's security team and Iraqi police who opened fire after the convoy failed to stop at a checkpoint in central Baghdad. Secretary of State Condoleezza Rice, on a surprise trip to Iraq, said Tuesday that national reconciliation has moved along "quite remarkably," citing a new law that allows thousands of former members of Saddam Hussein's Baath party to reclaim government jobs or pensions. Rice, who split off from President Bush's Mideast tour, said the Iraqi parliament's approval of the U.S.-sought benchmark law Saturday was a first step and showed that last year's "surge" of American forces was paying dividends. A fire broke out early Tuesday in a major oil refinery in the southern city of Basra, the Iraqi oil ministry said. Four workers suffered burns. Iraqi Oil Minister Hussein al-Shahristani said a preliminary investigation indicated that a U.S. helicopter hovering over the refinery was to blame. "This is what caused the fire and led to the leakage of a huge amount of liquid gas as the blaze hit the gas production unit," al-Shahristani said in a statement. He added that his ministry "had warned many times against aircraft flying above oil institutions and especially refineries." It was not clear how the helicopter's presence caused the fire. Turkish warplanes bombed Kurdish rebel hideouts in northern Iraq on Tuesday, the military announced. It was the fourth aerial attack on rebel positions in northern Iraq since the military launched a bombing campaign on Dec. 16. Prime Minister Recep Tayyip Erdogan vowed on Monday to "finish" the rebels soon. Two bombs exploded in central Baghdad early on Tuesday injuring 8 people, Iraqi police said. According to police the wounded were two policemen, three cleaners, and three bystanders. The first explosion was followed shortly afterwards by a second blast in Karradah neighborhood, during rush hour.